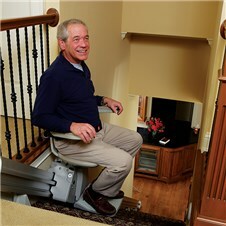 Are you researching stair lifts as a possible solution to mobility challenges you or a loved one are currently facing? 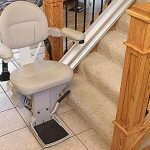 You may be wondering whether stair lifts are really safe, and whether there are actual stair lift safety standards. The answer is yes – they are safe, and they are also required to conform to state stair lift safety standards for lift design and installation. 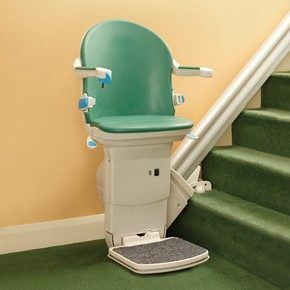 Since stair lifts are technically advanced products that contain sensitive electronic components, the state of Georgia requires that the stair lift installation be performed by a Georgia certified stair lift installer, under the oversight of an independent inspector. While the previous information may be comforting to hear, you may still be wondering if the unit itself is really safe, and especially whether you or your loved one can easily and safely get on and off the lift. 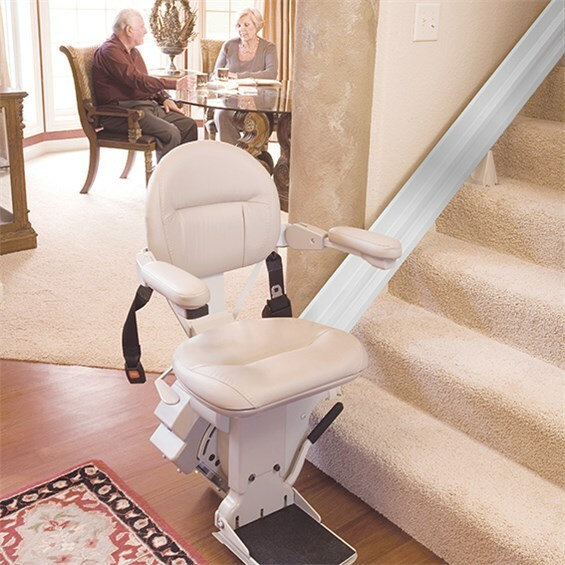 Foremost in the 10 best stair lift safety features are swivel and lock features that make straight and curved stair lifts safe and easy to use. Swivel seat – To ensure optimum safety, the swivel seat rotates so that the user can get on and off easily and quickly – and not dangling over the steps to do it! This feature is a significant advantage to those who struggle with balance problems as well as fragile or easily bruised limbs. Seat belt – For an extra sense of security, a safety belt is to be worn during every trip up and down the stairs as one of the important stair lift safety standard to be maintained. Plush, roomy seat – Selected to accommodate your size and weight, the stair lift seating is designed to be ultra comfortable for not only safety but also enjoyment during use. Arm and foot rests – There are no worries about where your arms and legs can be during transit – the padded arm and foot rests make such concerns obsolete. Foldaway design – When the lift is not in use, you have the option of folding the seat out of the way of foot traffic. Auto stop – Among the numerous stair lift safety standards built into your lift, an especially helpful feature is the built in sensors that detect obstructions in the line of motion. When this occurs, the lift will not move until the path is clear for smooth, unhampered movement. Call-send button – An extra feature of stair lifts can include the handy call-send option, which allows the lift to be “summoned” from another level. Battery power – Unlike electrically powered devices which are unusable during power outages, many stair lift companies are opting for battery powered equipment, which means that whenever you need the lift, it’s ready for you, regardless of the circumstances. 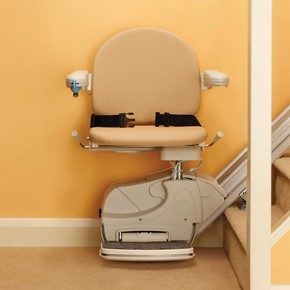 Multi-user capability – Another evidence of stair lift safety standards hard at work are the extra features which allow for regular use of more than one user in the home. Flip-up rail – Optional equipment includes a flip up folding rail which moves out of the way at the foot of the stairs to enable space for pedestrians, or a door swing. One major safety issue we’d like to offer a word of caution about is that some stair lift companies promote low cost do-it-yourself (DIY) stair lift products they describe as easy to install. 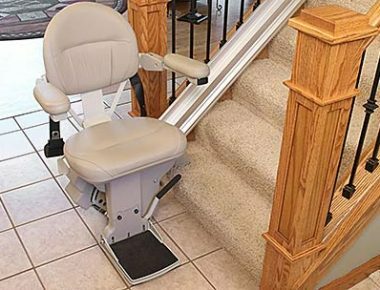 Once received and unpacked, most homeowners do not have the expertise to know how to safely and properly install a stair lift. They also may not know who to call to get the lift installed and tested as the state requires. Retaining the services of an expert handyman is also unadvised, as they will not have the factory training to install the lift according to the manufacturer installation requirements, and the stair lift warranty may thereby be voided. Any more questions? Your trusted stair lift safety standards expert at Stair Lifts Atlanta, LLC can help you find the stair lift which is perfectly suited to you. 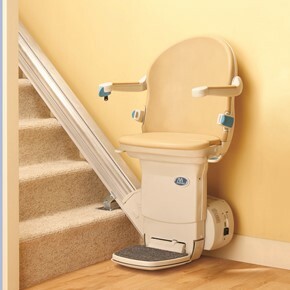 Call Stair Lifts Atlanta, LLC at 770.880.3405, or send an email using our website contact form to the right to schedule a complimentary home assessment for stair lifts in north Georgia. This entry was posted in Curved Stair Lifts, Outdoor Stair Lifts, Stair Lift Blog, State of Georgia Certification, Straight Stair Lifts and tagged Atlanta, curved stair lift safety, georgia certified stair lift installer, indoor stair lift safety, outdoor stair lift safety, stair lift safety features and standards, straight stair lift safety. Bookmark the permalink.